January 5, 2011 - Bombardier Aerospace announced that SkyWest Airlines has placed a firm order for four CRJ700 NextGen airliners. 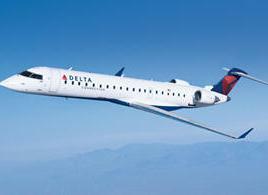 The aircraft will be flown by SkyWest Airlines under the Delta Connection banner in a dual-class configuration with 65 seats. Based on the list price of the CRJ700 NextGen airliner, the contract is valued at approximately $148 million US. SkyWest Airlines, Inc. is a North American regional airline headquartered in St. George, Utah, flying to 161 cities in 39 U.S. states and 7 Canadian Provinces. The airline serves as a feeder airline, operating under contract with various major carriers. It flies as as SkyWest Airlines in a partnership with AirTran Airways, United Express on behalf of United Airlines and as Delta Connection on behalf of Delta Air Lines. SkyWest Airlines is one of two airlines owned by SkyWest, Inc. - the other being Atlantic Southeast Airlines. Combined the two airlines make up the tenth-largest airline in terms of number of planes, operating 440 regional aircraft. As of 2010, the airline employs over 10,000 people and averages approximately 1,840 daily departures across its network, with 1,269 operating as United Express, 541 operating Delta Connection and 32 as AirTran Airways. SkyWest Airlines and its sister airline, Atlantic Southeast Airlines, currently operate 406 CRJ200, CRJ700 and CRJ900 regional jets, the world?s largest fleet of CRJ aircraft. ?This order re-affirms our complete confidence in Bombardier?s CRJ regional jets,? said Jerry C. Atkin, Chairman and Chief Executive Officer, SkyWest, Inc. ?Since becoming a launch customer almost 20 years ago, SkyWest has benefited from the CRJ aircraft?s operational efficiencies and excellent economics.? ?SkyWest has played a large role in the success of the CRJ aircraft program and we are delighted with this additional order,? said Gary R. Scott, President, Bombardier Commercial Aircraft. ?Bombardier?s CRJ Series aircraft have become a benchmark for regional jet efficiency in the 50- to 100-seat segment and are the optimized solution for medium-haul operations.? Including the transaction announced, Bombardier has taken firm orders for 1,713 CRJ Series aircraft, 1,606 of which had been delivered to operators around the world as of October 31, 2010. The CRJ700 is a stretched 66-78 seat derivative of the CRJ200, with 70 seats being the most common. The CRJ700 features a new wing with leading edge slats and a stretched and slightly widened fuselage, with a lowered floor. The aircraft is equipped with the General Electric CF34-8C1 engine. Maximum speed is Mach 0.85 (556 miles per hour) at a maximum altitude of 41,000 feet (12,500 m). Depending upon payload, the CRJ700 can travel up to 2,250 miles (3,620 km) with current engines, and a new variant with CF34-8C5 engines will be able to travel up to 2,895 miles (4,660 km). The CRJ700 comes in three versions: Series 700, Series 701, and Series 702. The 700 is limited to 68 passengers, the 701 to 70 passengers, and the 702 to 78 passengers. The CRJ700 also has three fuel/weight options: standard, ER, and LR. The ER version has an increase in fuel capacity as well as maximum weight, which in turn increases the range. The LR increases those values further. Its first flight was in 1999 and it entered service in 2001. The aircraft's FAA Type Certificate designation is the CL-600-2C10. The first airline to fly a CRJ700 was Brit Air in 2001. The CRJ-700 directly competes with the Embraer 170, which typically seats 70 passengers. However, the CRJ-700 is 10% more cost-effective to operate than the E-170. In 2008, the CRJ700 was replaced with the CRJ700 NextGen, featuring improved economics and a revised cabin common to the CRJ900 NextGen and CRJ1000 NextGen. Bombardier is a leading manufacturer of innovative transportation solutions, from commercial aircraft and business jets to rail transportation equipment, systems and services, Bombardier Inc. is a global corporation headquartered in Canada. Its revenues for the fiscal year ended Jan. 31, 2010, were $19.4 billion.